Well, duh! 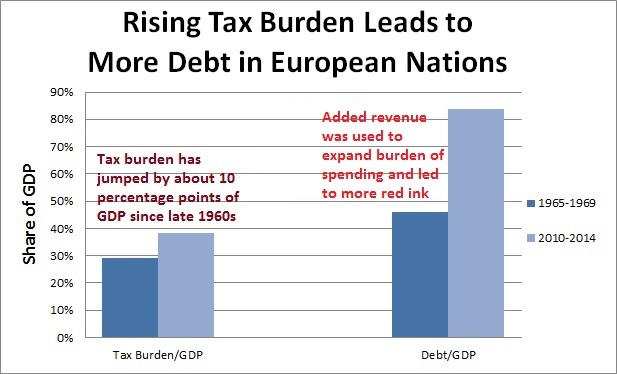 Higher taxes and higher spending will ad more debt than lower taxes and lower spending. Try explaining this basic fact to liberals. 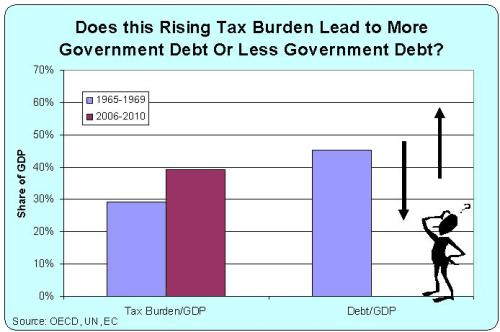 I haven’t checked lately, but increased revenues have generally led to increased deficits. When DC takes an extra buck, they spend a buck-fifty. Well, duh! Is this not perfectly obvious? on February 28, 2016 at 1:52 am Ralph DiMeo Jr.
Zorba … The DC crowd could be expected to portray a state’s defiance as secession. But America is far more than 50 states bound together by fealty to DC. It is time to remind DC that the federal government is a creation of the states and not the other way round. The taxation and regulation imposed by DC causes far more harm than good. If one state (Texas!) decided to choose for itself which federal regulations to honor, and how much money, if any, it would send to DC, other states would soon follow. Overall this would be of enormous benefit to Americans. And one of the benefits would be much greater national cohesion. Higher taxes also dampen growth. Which makes it impossible to keep up with public expectations of ever rising state programs and handouts. “But I swear, ‘free’ healthcare is the one last thing I’ll ask for. The last 10% of economic output I will communitize”. Does anyone believe that? In other words once you get to European levels of 1-1.5% growth trendlines (hence establishing your deterministic decline in a much faster growing world) do you stop there? Or do you accelerate the decline even further by asking for even more state help so you can cope with the deteriorating economic condition? The stresses that result from statism’s slow growth environment cause electorates to desperately turn to even more statism for immediate relief. The decline rate steepens. The vicious cycle nearly inescapable. If those ECB scholars run for office in Europe, they’ll get about 10% of the vote. While politicians’ interests must be understood as intrinsically linked to higher and higher levels of coercive collectivism (after all, the production of coercive collectivism is the essence of a politician’s job) the public obviously plays an integral part in this process. In other words, as TKList eloquently summarizes: “It’s the voter, stupid”. But nobody wins elections on that motto. on February 27, 2016 at 12:20 pm Ralph DiMeo Jr.
No disagreement with Mr Mitchell’s title, and lots of great stuff in TKList’s response. 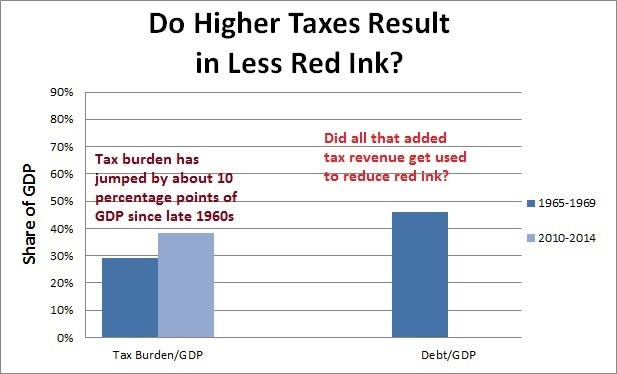 For quite a few years, we saw greater government revenue actually increase the deficit because they spent about $1.45 for every extra buck they took in. Big government is owned by the wealthy and paid for by the middle class and poor one way or another. The tax code is manipulated by the wealthy; cost to comply is paid by consumers through higher prices. It increases lobbyists, corrupts politicians – increases difficulty of entry for competition, which causes less employment opportunities for workers and higher prices. Excessive regulation increases cost for consumers, decreases job opportunities, corrupts politicians, increases lobbyists – increases difficulty of entry for competition. National debt: $151,000 cost per household paid by the consumer not the rich, through higher prices or lower standard of living. Federal Reserve: low interest loans for wealthy and connected, by the time it reaches lower rungs – rates higher, prices higher – including CEO pay increasing the inequality gap. The national debt keeps increasing because of deals, aka compromises, between Democrats (social programs and entitlements) and Republicans (corporate welfare and defense). The middle class pays the heaviest burden for the debt; as it goes up, it further increases the inequality gap by lowering their standard of living. National Debt: $18 trillion costs or is financed by each household, who is ultimately responsible for that debt. This comes out to $151,000 per household if paid for in one lump sum. Financed for 15 years at 5% interest it would take a monthly payment of $1186. Do not be fooled each household pays this one way or another, not the rich; whether you pay it directly in taxes and fees, higher prices or by a lower standard of living than you would otherwise have if the government had not spent that money. The question is: Is your household getting its money’s worth?